As we were holidaying without a car (cue disbelief, shock, and horror from pretty much everyone else we met! ), we travelled down on the train to Poole, and then took a taxi to Farrs Meadow itself. 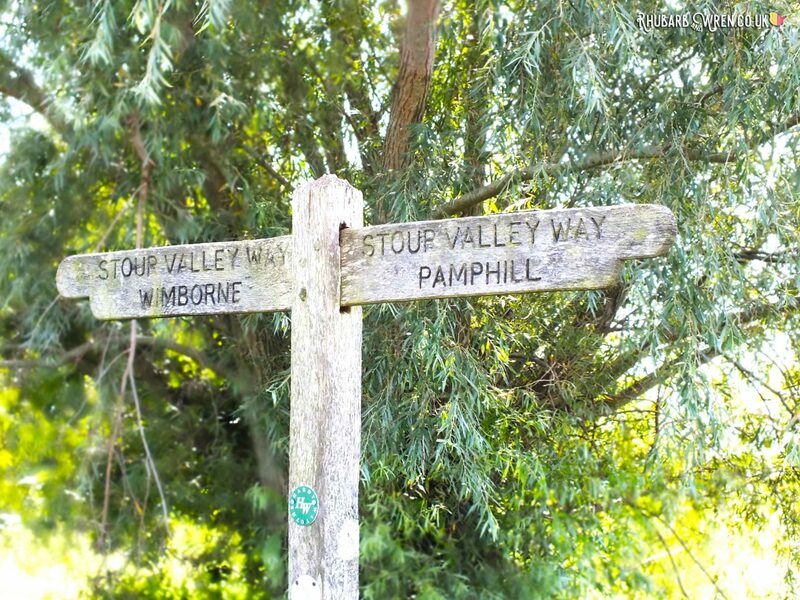 Just outside the pretty little town of Wimborne, the campsite consists of a couple of meadows nestled within a wood on a hillside overlooking the Stour Valley. It’s an idyllic country setting, and as cars are restricted to the car park, it’s the kind of place you can happily let the kids run free. And run free (or should that be feral?) ours certainly did. 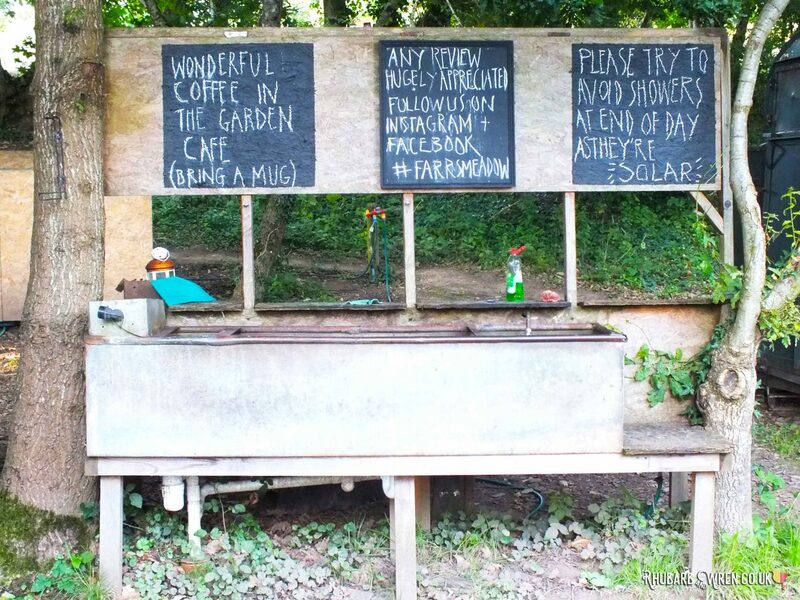 The small carpark is at the entrance to the Farrs Meadow campsite, along with a large, shed-like reception where David, the owner, was busy kneading pizza dough when we arrived. To the left of this is a little path leading to a secret garden with a sheltered terrace area housing an old leather sofa and an assortment of other seats. It’s here that you’ll find a little stone building, possibly an old piggery, with two rooms – one for the communal (and free to use) fridges, freezers, microwave, and plug sockets (for charging the electronics you just can’t leave behind). 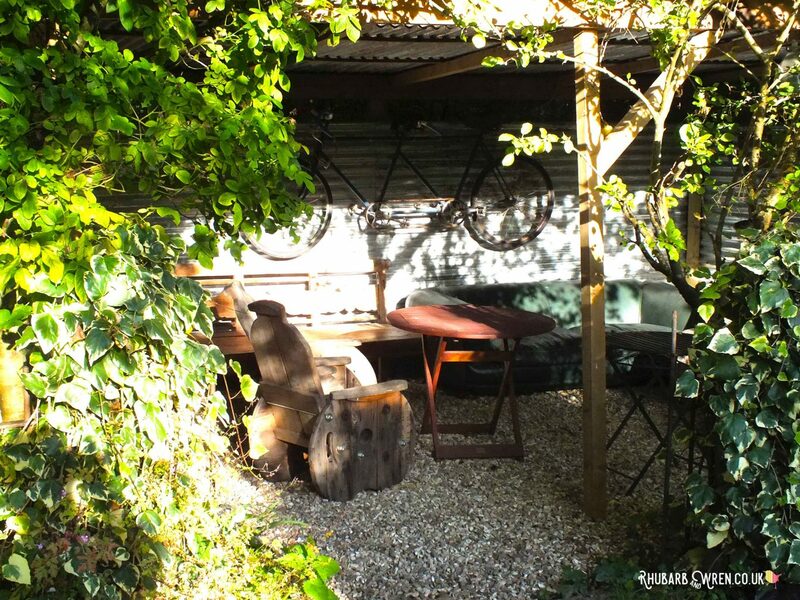 The terrace in the secret garden, where teas and coffees are served in the morning. The other room serves as a little cafe where, for a few pounds, David will make you tea or delicious frothy coffees in the morning, while also providing great advice for days out from his wealth of local knowledge. 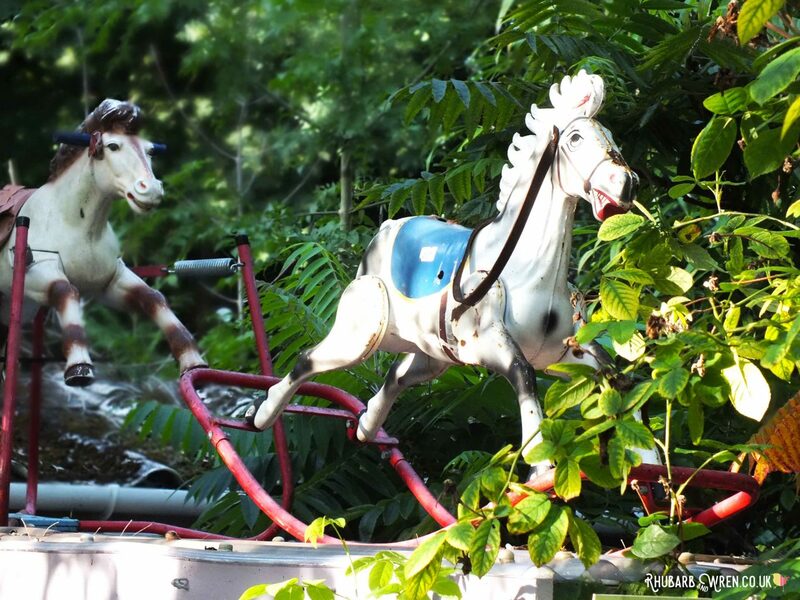 We loved the quirky decor – an old unicycle and tandem bike are fixed to the walls above the sofa, and there are a couple of vintage childrens’ rocking horses on the roof. It’s a lovely spot to have your morning brew, or you’re welcome to take it back to your camp. Some of the quirky vintage decor at Farrs Meadow campsite. Just above the carpark (literally, as it’s uphill!) is the largest field at Farrs Meadow, which is for ‘proper’ tent camping, though there are also three furnished yurts and an old converted stable for the die-hard four-walls-and-a-roof holiday-makers. The lower field next to the car park (still high up on the hill) is the wagon meadow – there are two gypsy caravans and two charming shepherd huts ranged around the edges, each with its own fire pit, table and chairs. There’s enough space that you don’t feel on top of the other guests, while still being close enough to encourage neighbourly chats. As the weather forecast hadn’t been great, the site was relatively quiet, and we actually had the meadow to ourselves for half the time, so it’s definitely worth checking for last-minute availability. 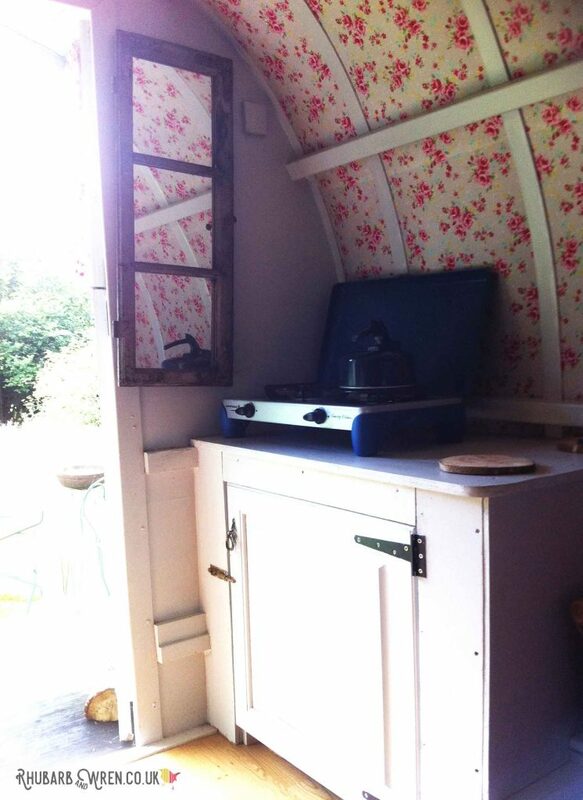 One of the shepherds huts for hire at Farrs Meadow, dorset. Inside the gypsy caravans, for sleeping there was a raised (small) double bed at the far end, with a floor-level mattress for the kids underneath, bunk bed style. A duvet and four pillows were provided for the grown-ups on the top, so you just need to bring sleeping bags for the kids. The wagons were warmer than a tent but I still never camp with anything less than good 2-3 season sleeping bags (less than that is for in-a-house sleepovers only as far as I’m concerned!) – if you’re a camping novice, you might be surprised at how cold even a summer night can get. Our little ones were toasty in their beds, and we were plenty warm enough with the bedding provided. At six foot, K-Dog did feel quite cramped in the bed – he couldn’t quite lay out fully, so I wouldn’t put the comfort at real-bed levels, but I’ve had far less comfortable nights camping. And don’t be fooled – it might be pretty but this is still camping! 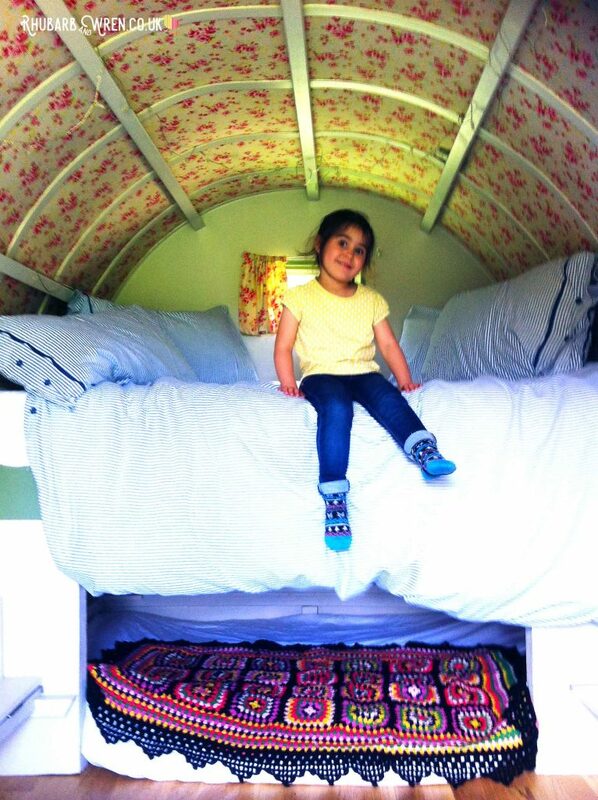 Inside the green gypsy caravan at Farrs Meadow, Dorset. The caravans aren’t huge by any means, but there’s enough space in both for a couple of cupboards to store your food and some bits in, though not for your luggage so space is a bit tight in wet weather. Each caravan has a double-burner camping stove that, for camping novices, lights just the same way as a gas hob on a normal cooker. It’ll be all hooked up to a gas canister underneath when you arrive, and there’ll be a few matches to get you going – but do bring your own as these won’t last long. You’ll also find a kettle and enough pots, pans, dishes and utensils to keep four people fed and watered, so you can cook a full meal inside, and boil water for your tea and coffee. 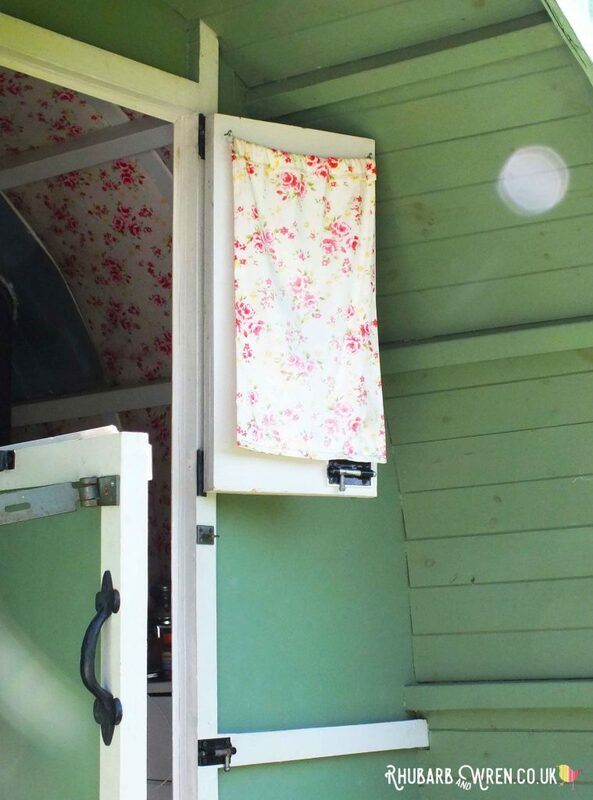 Stable doors and pretty floral curtains! A little storage and camping stove. 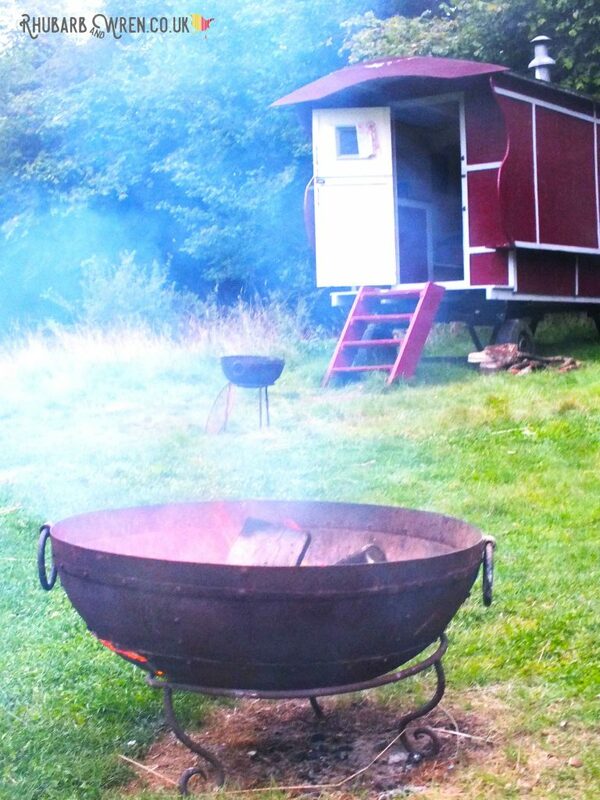 Outside, each caravan has its own fire pit, a table and four chairs. Not long after we arrived, Simon (one of the Farrs Meadow team) wandered up with mason jars full of freshly cut flowers he’d collected as he trimmed back the plants. We kept ours on our table all week and the kids took great delight in adding to the display. Inside the wagon there’s a lantern or two, along with a supply of tealights, but you will need to bring torches too, and I’d recommend a camping lantern. We used (affiliate link) collapsible multi-purpose ones – they can be used as a torch when closed, or opened up to a little (but bright) lantern with a hook for hanging. They were especially good for us as we were travelling light and they take up very little room when packed. 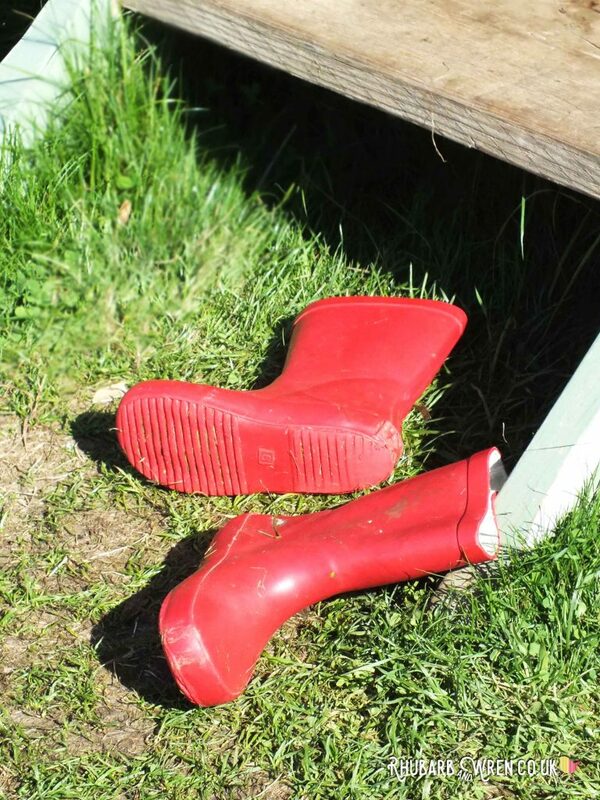 Wellies are a must on any camping holiday! 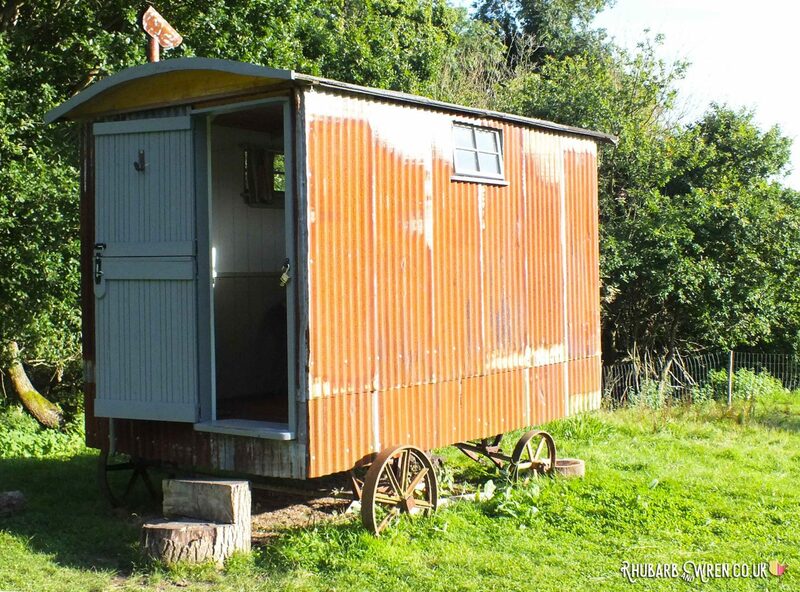 The red gypsy caravan at Farrs Meadow, Dorset, sits next to the green one. The area between the two Farrs Meadow fields contains most of the communal facilities. Most noticeable are the row of horse-boxes which have been converted into solar shower units. It’s a lovely way to start the morning, with plentiful hot water and a view of the surrounding trees. The opening is more than high enough to preserve your modesty, and there’s something wonderful about showering practically out in open air (though of course you are under cover and technically inside the box!). They were also great for showering with young kids as there’s plenty of room in the boxes – the biggest one especially had a shower tray plenty big enough for me and both kids together. Being solar showers, you’re advised to use these in the morning to be sure of hot water. I’ve heard mixed reports on solar showers, but have to say we didn’t have any problems with either temperature or pressure – though admittedly the site was fairly quiet while we were there. The showers are basic but good! 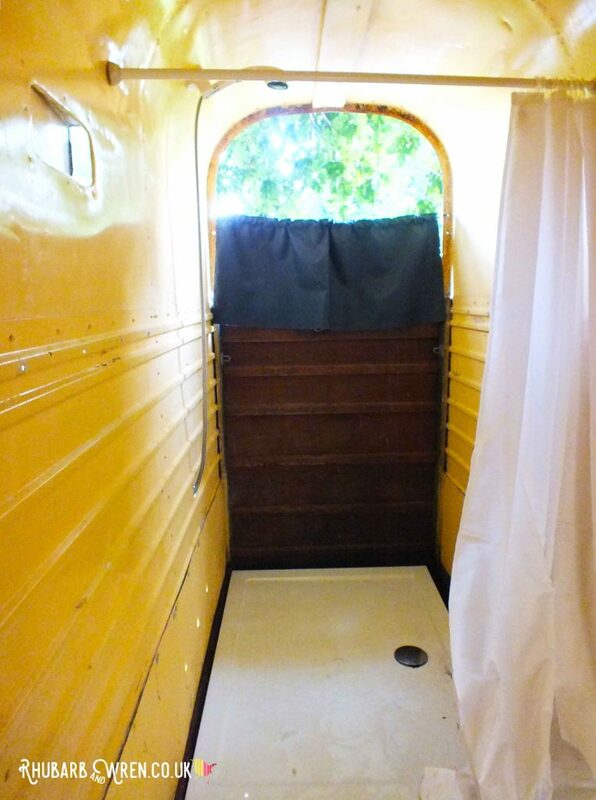 The smallest horse box shower. Up in the camping meadow, and at the bottom of the wagon field, a few further horse boxes house long-drop composting toilets. This was our first experience of eco-toilets, and I was a little worried about how the kids would react to doing the necessary while sat on an OSB board plank over a deep, thankfully-dark, hole. But it turns out I needn’t have worried. The first night at Farrs Meadow, our three-year-old T-Bird required five trips down to the bottom of the field, clutching her lantern and oo-ing at the occasional bat and the rabbits that bounded away from her. 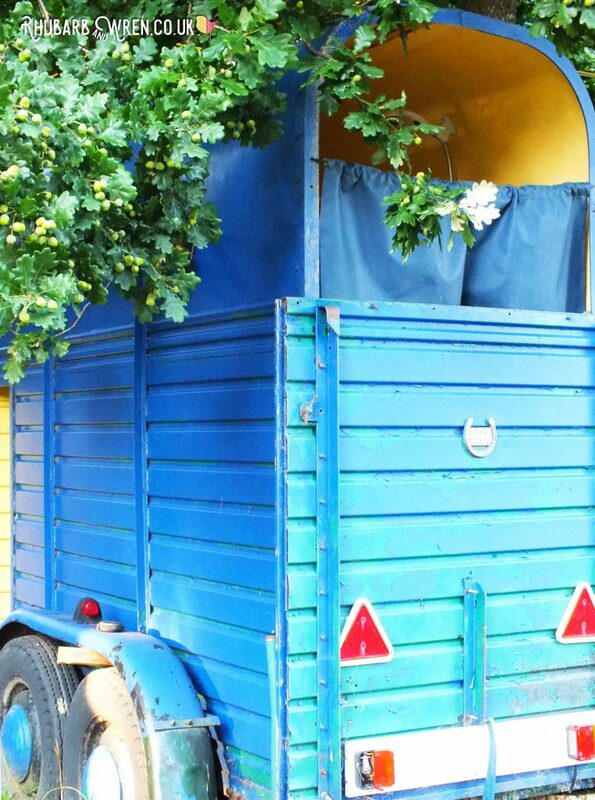 She loved climbing in through the tiny horsebox side-door and into the hay-strewn interior. And she adored chucking handfuls of sweet-smelling sawdust into the hole once done. We had to put our foot down at trip number five, or she would have been up and down that field all night! If you’re wondering, other than putting a spadeful of sawdust down after you rather than flushing water, the toilets work exactly the same as a normal one (yes, you do throw toilet tissue into the hole too!) and there were no nasty odours – in fact they smelled only of sawdust and fresh hay, so rather more pleasant than many conventional ones. Of course, traipsing across a cold field in the middle of the night to use the loo is never anyone’s favourite part of camping, but the fact that these were composting certainly didn’t make the experience any worse. 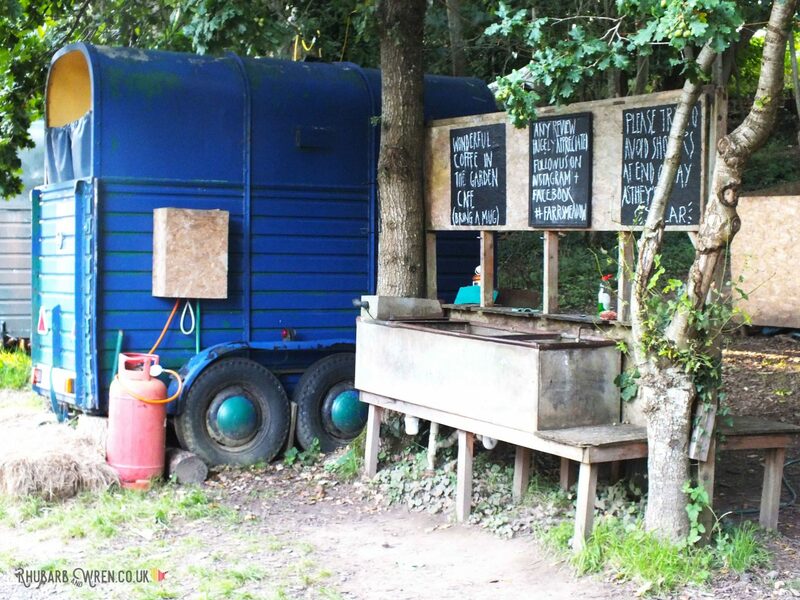 The communal sinks and horse box showers sit between the two camping fields. As for the other facilities, a couple of cattle troughs have been converted into a washing-up/water station set between the showers. The water is cold and good for drinking – for hot water, you just fill a bowl from the water in the showers right next to it. A large water carrier (with a turn valve) and washing up bowl comes in the kit supplied with the caravans, so if you’re staying in any of the wagons and huts, you just need to bring soap, dishcloths and tea-towels. But if you forget these (or anything else! ), Wimborne has a large Waitrose and a Co-Op supermarket that can supply pretty much any essentials, and are easy to get to even on foot (as we were!) walking in from Farrs Meadow. I do wish there had been some laundry facilities on site, but that was about the only thing missing! The kids loved washing up and fetching drinking water from these great upcycled sinks. Next to the showers, ensconced among piles of wood cut from the site, is a cute little Tuk-Tuk van, holding a wood-fired oven. Every Saturday evening, fresh pizza, made completely from scratch, is cooked on site to order. Once ready, your pizza is put into a giant cardboard pizza box to take back to your campfire and enjoy. Alas, our kids are among those rare and strange breed who don’t actually like pizza, so we were forced to give it a miss. It looked and smelled very good though – I’m sure we would have caved and tried some had it been on offer any other night! 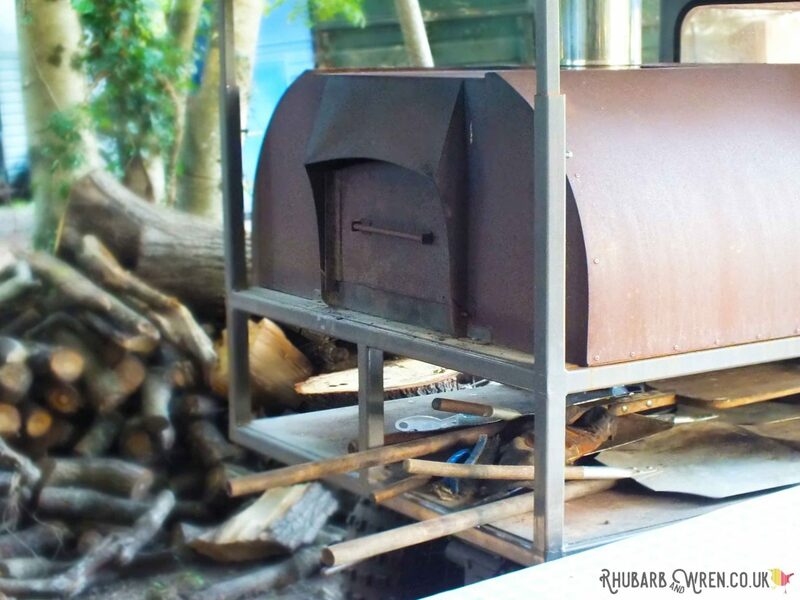 This old tuk tuk van has been converted into a woodfired pizza oven. 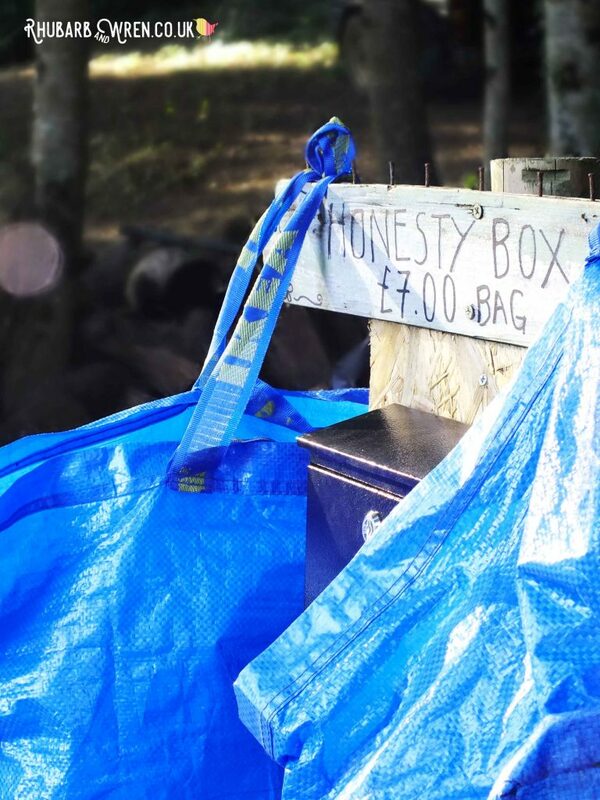 The wood around the Tuk-Tuk is harvested from the Farrs Meadow site, and you can fill one of the big blue Ikea bags provided here with wood to use on your campfire – there’s an honesty box for the seven-pound charge. However as the weather had been quite damp the week before, we found most of this wood a bit too damp to burn without further splitting with a hatchet, so to get our fires going we used BBQ logs bought at the supermarket instead. I’d also recommend bringing a box of firelighters to make things even easier! If you’ve never lit a campfire before, read up on the essentials beforehand and ensure that you’ve a washing-up bowl of water ready to fully extinguish the embers when you are ready to go to bed. Bags hang ready to be filled with firewood. 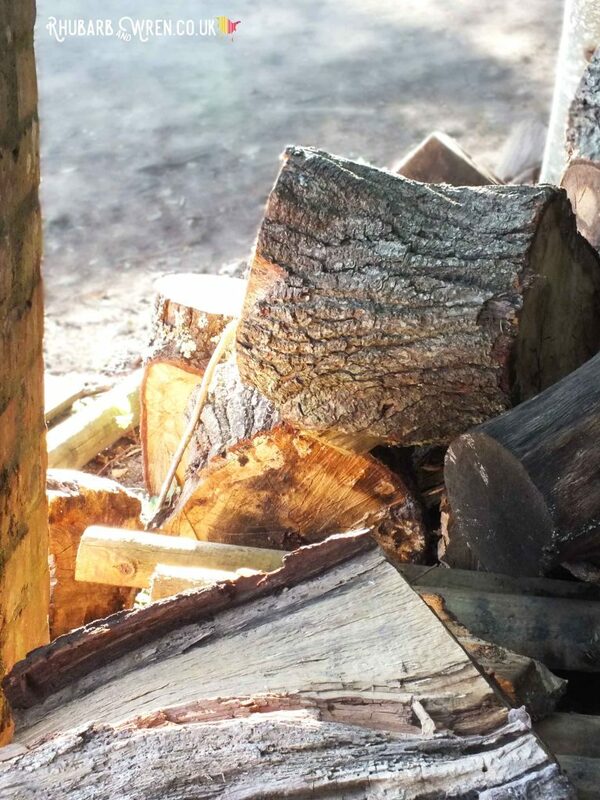 A pile of logs waits to be turned into kindling. There’s nothing quite like having a campfire to sit around on a summer’s evening, and it helps make the experience at Farrs Meadow that bit more special so for us it was definitely worth making the effort. You are also welcome to bring your own fire pit (and wood), or campers can hire Farrs Meadow ones for £5 or £10 (small or large). The kids loved finding, whittling and, of course, using sticks for toasting marshmallows over the campfire. 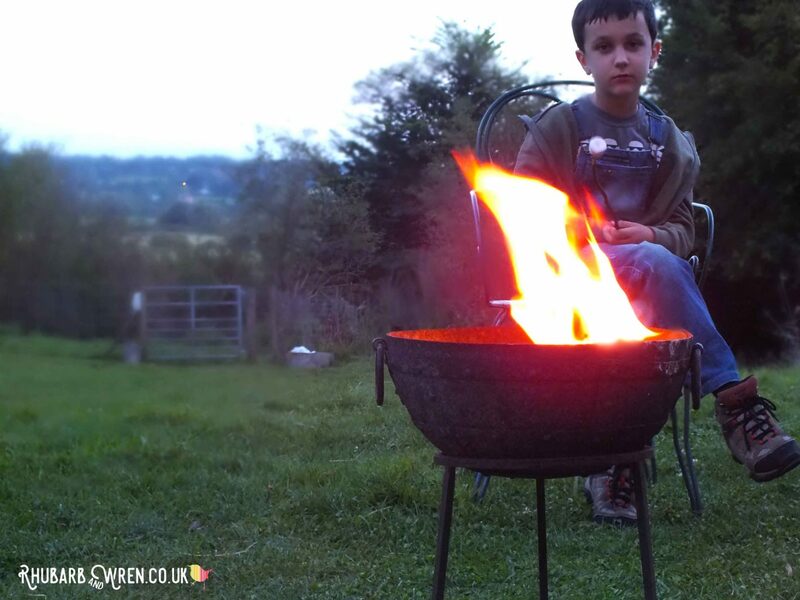 If you’re staying in a wagon, hut or yurt, a fire pit is provided for you to use, so take advantage of it! 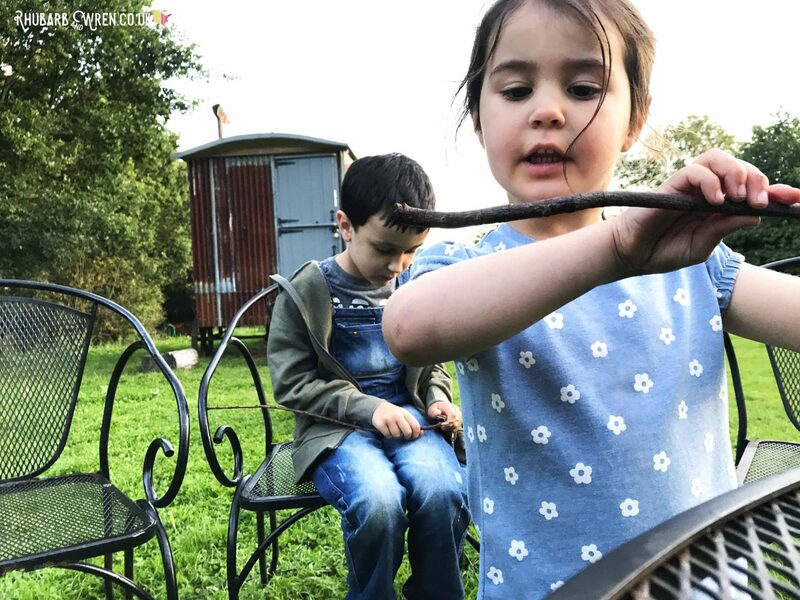 We brought along marshmallows and a penknife to whittle some long sticks into skewers – finding, making and using these was one of the kids’s favourite activities on the trip. There’s a lovely close-to-nature wildness about Farrs Meadow, and it’s impossible to talk about a stay there without mentioning the wildlife. The meadow and surrounding trees are home to a number of rabbits, squirrels, and bats, and the next door field houses a friendly herd of Friesian cows. Wild deer and foxes are sometimes seen on site and there’s also the odd owl, often heard hooting in the evening. Though I didn’t manage to catch sight of these, an owl did scare the life out of me one night by landing with a screech on top of the horse box-toilet while I was in there – I have never jumped so high in all my life. If you’re staying during June and July, you may also see the lights of the native glow worms (actually a type of beetle) amongst the long grass after dark. We didn’t see any, but as our arrival coincided with the Perseid meteor shower we spent most nights looking up, not down! 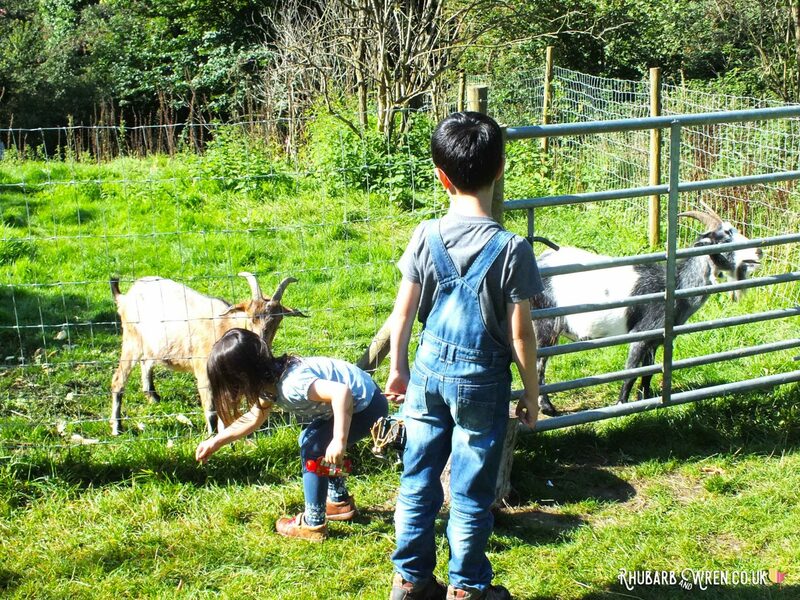 At the bottom of the wagon meadow, a fenced-off area is home to Farrs Meadow’s two goats – we were reliably informed by the roaming gang of campsite kids that their names were Boris and Bernard. They’re lovely, friendly animals and the kids loved being able to scamper down the field every morning to say hello. Petting them was encouraged and there was a dispenser of foam soap on the fence for hand-washing afterwards, which was always kept filled during our time there. Boris and Bernard, the Farrs Meadow goats. Further afield, there are lovely walks along the river into Wimborne, or in the opposite direction to the Eye Bridge where you can go for a swim. The little hamlet of Pamphill is only a short walk away, where you can enjoy a drink at the tiny National Trust-owned ‘Vine Inn‘. For those, like us, travelling without a car, the local bus service is excellent and it’s easy enough to head farther afield. We had decided before hand that we didn’t want to spend our short break rushing around to tourist sites (and in any case it’s an area we’ve been to before), but we still managed to squeeze in some crabbing on the quayside at Poole harbour, and trips on the ferry to Brownsea Island, Swanage, and (by steam train) to Corfe Castle. If you do have a car, there are a million and one things to do in this area, and some of the most beautiful beaches in the country. Farrs meadow is surrounded by beautiful walks through the Stour valley and beyond. I come from a family of serious campers (unlike my city-boy other half!) and when I told them we were going on a gypsy caravan holiday, there were a few derisory cries of ‘glamping’ thrown at me. 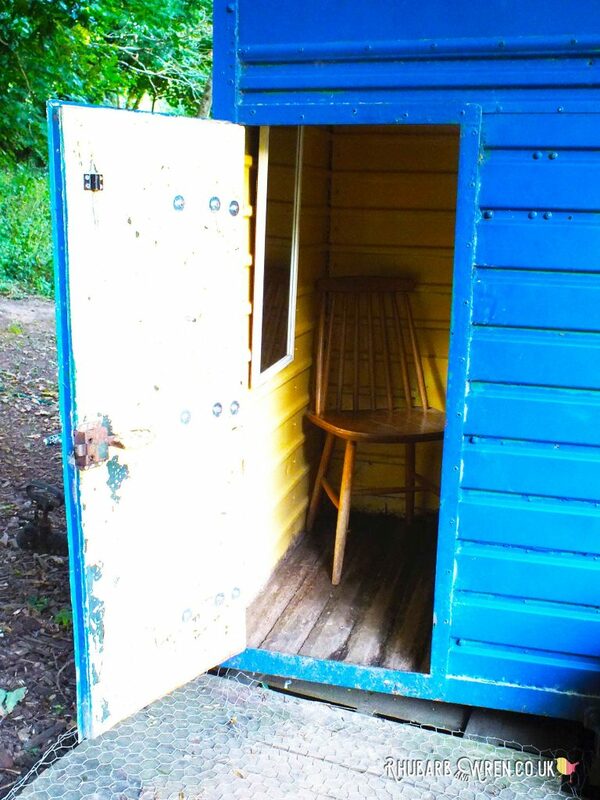 But having now experienced it, I have to say that what Farrs Meadow offer is not at all what I would think of as ‘glamping’ – rather it’s a return to a wilder and closer-to-nature camping experience that you don’t often get on a crowded or more conventional campsite. And all with a dollop of vintage nostalgia thrown in to give it that extra bit of romance. We all loved the eco approach to the facilities, but there’s no denying that also makes them only a step up from basic. Showering in the open air or swimming in the river; cooking over a campfire; sleeping in a wooden wagon or tin hut – these are not experiences that give you the comfort and convenience of a boutique hotel in an outdoor setting (which seems to be what many expect from glamping), and in my opinion they are all the better for that. Yes, there will be bugs, mud and (probably) rain, but there will be so much more besides. The highlight of each day camping was our walk through the surrounding countryside. As for the kids, they spent all day, every day, outside. They watched rabbits emerging at dusk, white tails bobbing in the dark. They saw bats skim by overhead on the hunt for moths as they ate fire-cooked dinners, and roasted marshmallows on sticks they had found and sharpened themselves. They stretched out beside our own gypsy wagon, way past their bedtime, bundled in blankets while they watched the Perseid meteors rain down like fireworks through the night sky, owls hooting from the trees, with cows lowing mornfully beyond. They played in the woods and fields and river; fed goats and fished for crabs; collected shells and acorns and funny-shaped sticks; rode on buses, and boats, and steam trains. 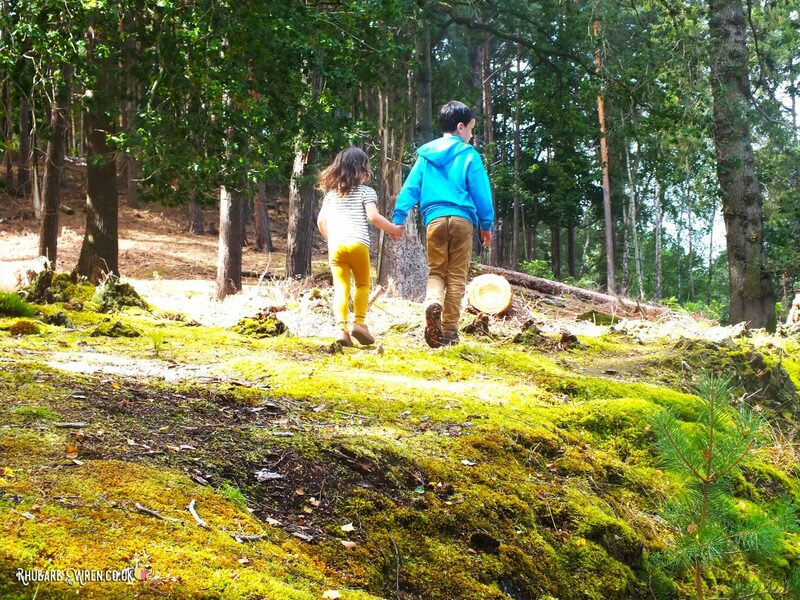 They stayed up late every night, finishing each day giggling and whispering within their sleeping bags in the bed nook inside the caravan, whilst their parents sat outside by the campfire drinking wine and talking. Some of this they did under our increasingly less watchful eyes. Some of it they did (thrillingly) out of sight – though rarely out of sound! – of their parents, free to roam in a way kids today rarely are. I think they had a good time. 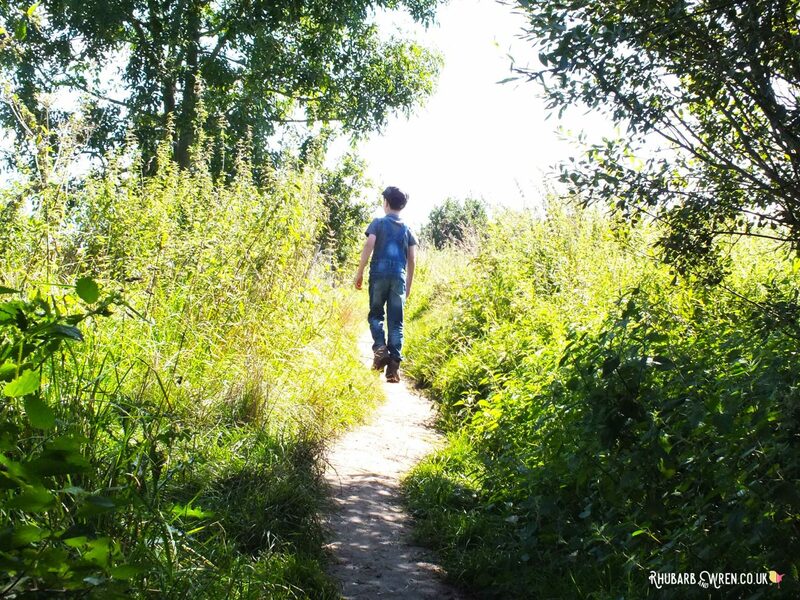 A car-free campsite like Farrs Meadow makes it easier to let the kids roam free. So it’s safe to say we loved our stay at Farrs Meadow. We couldn’t have had a warmer welcome or more helpful host, and the setting is absolutely beautiful. It’s a lovely alternative to camping more conventionally, and definitely an experience we hope to repeat. 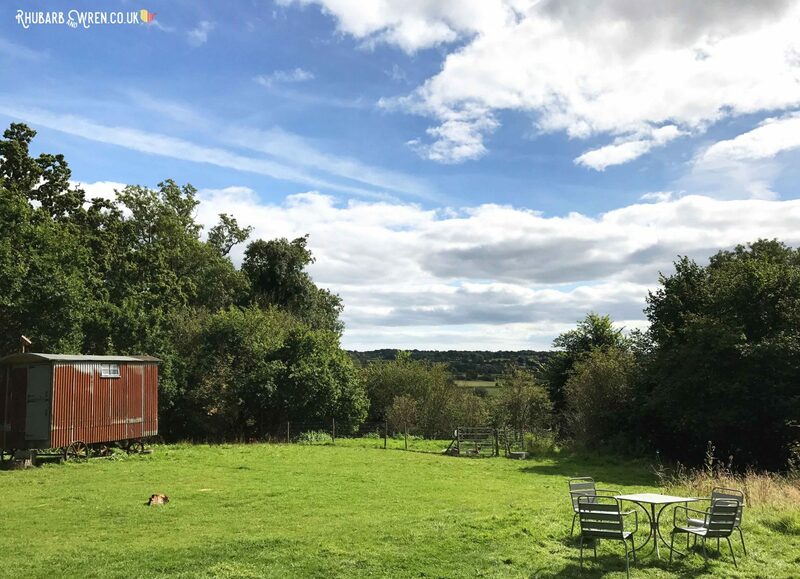 Farrs Meadow campsite in Dorset has beautiful views over the Stour Valley. 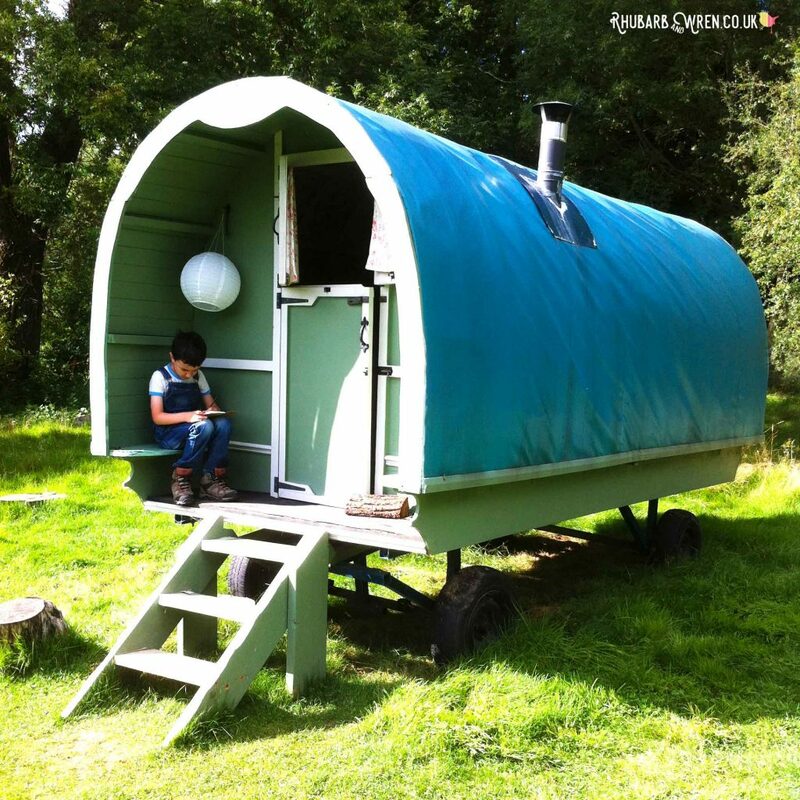 If you are thinking of booking a stay in one of Farr Meadows’ gypsy caravans or shepherd huts, this little list is the essentials we’d recommend taking to make the most of your stay, in addition to your usual clothes, towels, toiletries and groceries. Bear in mind though, that there is a large Waitrose and Co-op in Wimbourne, only a short walk or drive away. Metal cooking utensils (if you plan on cooking over the fire) – the supplied ones were plastic or wood. Wellies (I’m rather in love with my Joules Wellibobs) and Crocs (for the whole family, and yes, real ones really are worth the money). Waterproof picnic blanket and warm throws or blankets for evenings outside round the fire. You can find out more information about Farrs Meadow and book a stay online via Farrs Meadow’s own website or alternately on the Cool Camping page for Farrs Meadow. Enjoyed this post? Check out our other recent outing to the Harry Potter Warner Bros.Studio Tour, near Watford. We’ve loads of great tips if you’re taking a trip to the Warner Bros. Harry Potter Studio Tour! DIY Mini Doll Food – Made from Wine Corks! Sounds fantastic! We went camping this year and it was great. I’m unsure about next year, maybe a cottage but this sounds lovely. A few people stayed for a few days on the way to someplace else, to try it out – makes a great stop-over! I think it’s definitely one the kids will remember – they can’t stop talking about it!